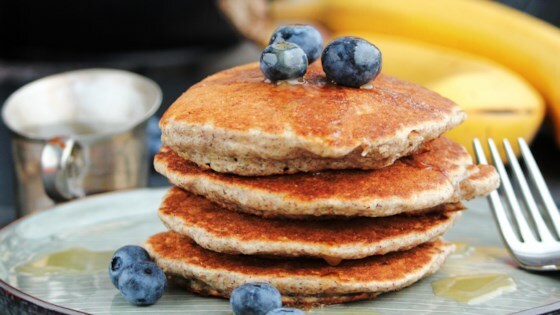 "These hearty pancakes are flavored with buckwheat and coconut. Don't expect a smooth-appearing cake. These pancakes appear lumpy because of the buckwheat groats. Even though these are wheat-free, they are not gluten-free! The honey may not be needed in the pancakes if you will be putting a sweet touch on the finished pancakes." Place buckwheat groats in a bowl. Pour boiling water over groats and set aside for groats to absorb water, about 10 minutes. Retain water if it doesn't all absorb. Whisk flour, coconut, and baking powder together in a separate bowl. Beat milk, egg, oil, and honey together in a third bowl. Stir buckwheat groats mixture and flour mixture into milk mixture until just combined. Spray skillet with cooking spray. Pour batter, 1/4 to 1/3 cup per pancake, into heated skillet. Cook until bubbles form and the edges are dry, about 2 minutes. Flip and cook until browned on the other side, 2 more minutes. Repeat with remaining batter.